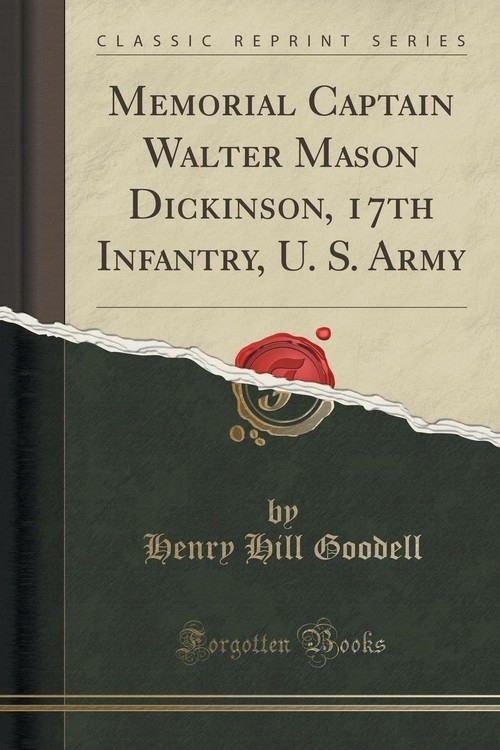 Memorial Services for Captain Walter Mason Dickinson, 17th Infantry, U. S. Army, were held on the afternoon of Wednesday, November 9, 1898, in the chapel of the Massachusetts Agricultural College. Born in the town of Amherst - receiving his early education at the college, and returning to it as military instructor in his maturer years, it was peculiarly fitting that the last services should be held there among his old associates and pupils. The address was delivered by the President, his lifelong friend and teacher, and the religious exercises were conducted by the pastor, Rev. Charles S. Walker, assisted by the Rev. Albert Bryant of Scituate. The pulpit was draped with the American flag, as was also his portrait, which stood upon an easel on the right of the platform. The sabre, worn on the field of El Caney, was slung above it, resting amid the folds of the college battalion flag, and beneath it was suspended a wreath of red and white roses, knotted with blue ribbon and intertwined with sprays of running vine. The front seats were occupied by the Senior class, the only members of the college who had been cadets under him. Eight members of the Junior class, in military uniform, acted as ushers. A large concourse of friends and relatives gathered to pay the last tribute to their hero.